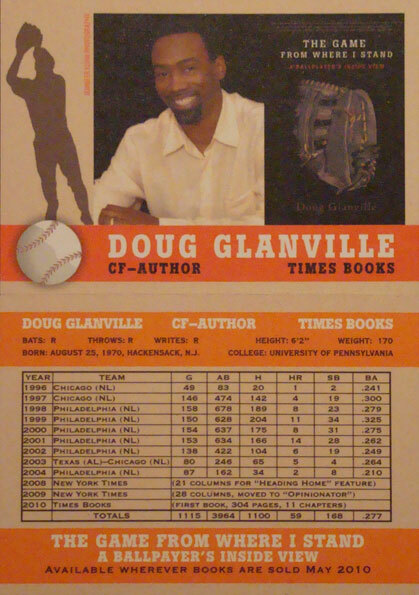 Former Cubs outfielder Doug Glanville is one of my favorite baseball writers. Educated at Penn, the Ivy Leaguer writes about baseball from an insider’s perspective for the New York Times, contributes on-air to ESPN television and appears on countless other radio and television shows. Not only is he a fine writer, but he brings the game of baseball to life like no other. If you haven’t read his NY Times op-ed pieces (you should check out his latest immediately) you can add his new book The Game From Where I Stand, A Ballplayer’s Inside View to your reading list. The book comes out this week and will be reviewed here shortly. In the meantime, order your copy today from Amazon or visit your favorite local bookstore. In his professional career, Glanville experienced every aspect of being a player—the first-round pick, the prospect, the disappointment, the can’t-miss, the cornerstone, the veteran, the traded, the injured, the comeback kid. His eye-opening book gives fans a new level of understanding of day-to-day life in the big leagues.